1. Sometimes the reaction to a frustrating search for your glasses is: "There I go again, my memory is slipping." Your memory ability may be just fine. The problem may be not paying attention. The simple step of developing a habit of actively paying attention can save much frustration. 2. Example: Perhaps you have had to search for your car keys, been in doubt as to whether or not you took your morning medication correctly, or found yourself in a room wondering what you came searching for? 3. Memory exercise: Pay attention - stop - look - listen. It takes no more than a second to say, "I am putting the keys in my jacket pocket." 1. Information must be rehearsed in order to be placed properly in long-term memory. 2. Example: You are in the shower and get an idea you wish to discuss with your spouse. You can't make a note, and you don't want that great new idea to slip away. What to do? 3. Memory exercise: You must rehearse (repeat to yourself) your idea to talk to your spouse. You may forget if you used shampoo and a conditioner, but you'll remember your new idea. 1. Most people have the ability to remember short lists, such as in a phone number, if they group - or “chunk” - the list items. 2. Example: Chunking to remembering a ten digit phone number. 3. 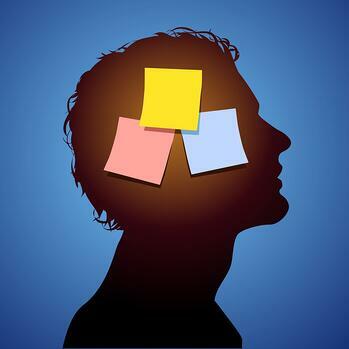 Memory exercise: Chunking will aid working memory. A 10- digit number 3013661755 can be remembered easily as 301 366 1755. Three small chunks, not one big chunk. 1. Make up a story that links together the things you want to remember. If the story is unusual, it will be easier to recall. For example, suppose when you awake in the morning you need to remember to put on your bathrobe and slippers, make yourself breakfast, take your medications. 2. Example: while eating your cereal the milk splashes on your bathrobe and slippers; your medications are at the bottom of the cereal bowl after you’ve finished eating your cereal. 3. Memory exercise: Make up a story for your morning routine. clothes to be taken to the dry cleaners by the front door. glasses, pills, notes to yourself etc. 4. Set the alarm clock or oven timer to help you remember to do something at a certain time. 5. Keep a good calendar and list of things to do. Keep a notepad in your pocket, by your bed and in your car. 6. If a notepad is not available, write on your hand. 7. Write notes to yourself and post them in conspicuous places.